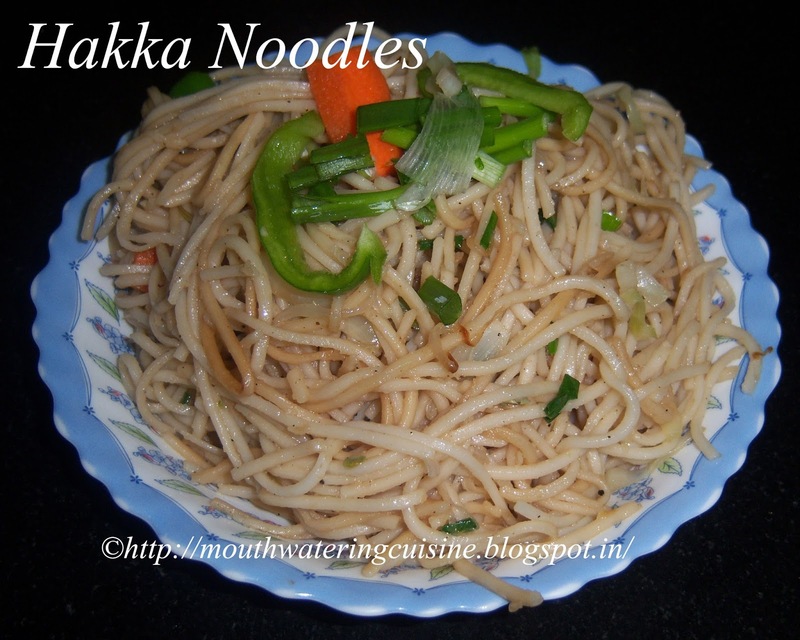 Veg hakka noodles is a popular Indo-Chinese dish served in restaurants and also in fast food centers across India. Everybody even kids also like as it has a mild taste. I got lot of appreciations for serving this. Whenever I thought of making such kind dishes, I would be a bit scary. Not because of its out come but because of the process involved in it. I always think any dishes other than South Indian are time consuming and needs prior planning and preparation, which is not right though. Coming to this dish, I have learned it from different sources. Mostly from a nearby Chinese fast food center and reference is from world's top chef Sanjeev Kapoor ji's FOODFOOD channel. I have a Chinese fast food center near my house, he serves very tasty Indo-Chinese dishes like Veg Manchuria, Gobi Manchuria, Hakka Noodles, Veg Fried Rice etc,.. I am a regular customer and always tries to observe the way he do it. For proper quantities I follow Sanjeev Kapoor's FOODFOOD channel. And finally the D-day came and I tried my hand in and I am in cloud nine with the accolades of my family members. 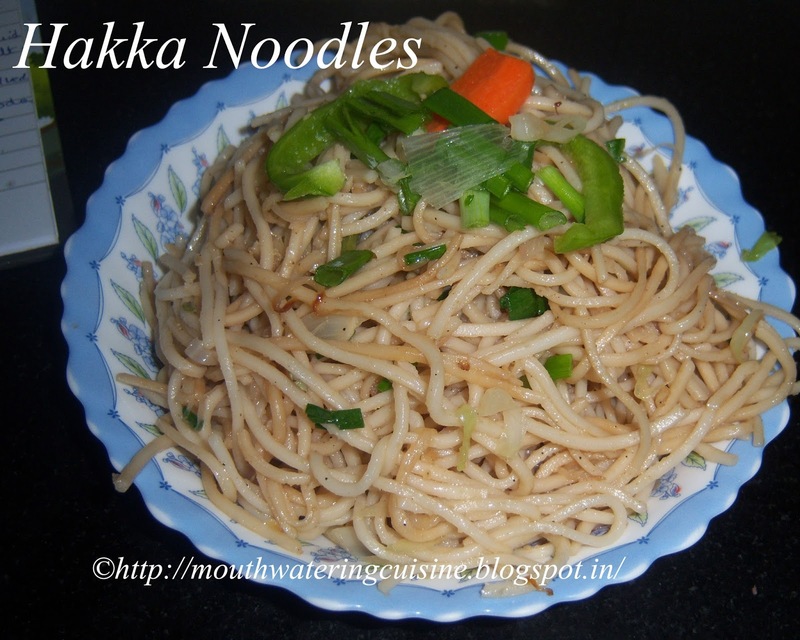 The main process involved in it is cutting veggies and boiling noodles. Cut the vegetables in length wise and shred cabbage. Boil noodles, cook vegetables and combine them with noodles. Add pepper powder and add main ingredient of any Indo-Chinese dish i.e. Soy Sauce. Serve hot. Cut carrots into thin strips and cut onions and capsicum length wise. Shred cabbage and cut the french beans into diamond shape or cut them diagonally. Cut the spring onions also, separate the green and whites. Keep the some greens for decorating. Add salt and boil water in a wide wok or kadai. 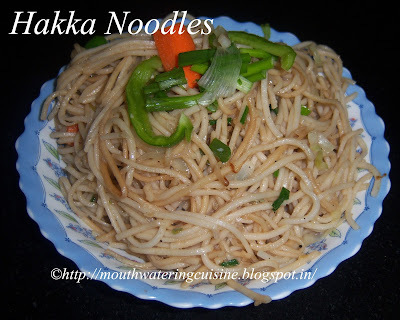 Immerse a colander in water and put noodles in it. Let them boil till they become soft. Remove from boiling water and put them in cold water. Keep them aside. Heat oil in the same kadai, add onions. Fry them till they become translucent. Once the onions become translucent, add french beans, fry them for a while. Then add carrot and cabbage. Fry them for two minutes. Once they become soft, add cooked noodles. Stir well. Once they mix well, add salt, soy sauce and pepper powder. Stir well or toss on a high heat. Add capsicum, spring onions and white vinegar and again toss.